London animation production company creates boldly stylised animated social spots for American gelato brand Talenti Gelato & Sorbetto. Fallon and Talenti launch a series of explosive animated social spots directed Christos & Yannis, who are represented by London-based animation studio NOMINT. The first in the series, Roman Raspberry, relays the story of Talenti’s first Raspberry Sorbetto. With a commitment to using artisanal methods and the finest ingredients, the team at Talenti packed so many raspberries into their ice cream machine that it broke! In the quirky social videos, animation company NOMINT brought the story to life with a bespoke bright blue CG gelati machine. The fast-paced spot sees a whole lot of juicy, vibrantly contrasting raspberries pummelled in to the machine until it explodes in an extravagant fashion. “Having worked with Fallon before on a Nutchello commercial, we were delighted to be brought on board to work on Talenti,” comments NOMINT Co-Founder and one half of the directing duo Christos & Yannis, Yannis Kostantinidis. According to the team at NOMINT, the machine and the raspberries were scrupulously simulated in CGI to make sure the film went off with a bang. The spot is part of a series of animations that vary in style, based on the intended platform. Succeeding Roman Raspberry, is New Flavors. In this commercial film Christos & Yannis use their signature animation style to take viewers across a world of flavours. Emulating the hand-sourced bespoke ingredients used in Talenti, the spot takes viewers on a journey to the origins of the sumptuous flavours in the gelato and sorbetto. The final work in the series is Sicilian Pistachio, which reverts viewers through an animated regression of the dessert’s ingredients. From the pistachio packed tub of flavoured gelato, viewers are taken back to the source of the pistachio’s growth in a story characterised by Christos & Yannis’s distinctive bursts of colour. Talenti first opened as a store-front gelateria in Dallas, TX in 2003. 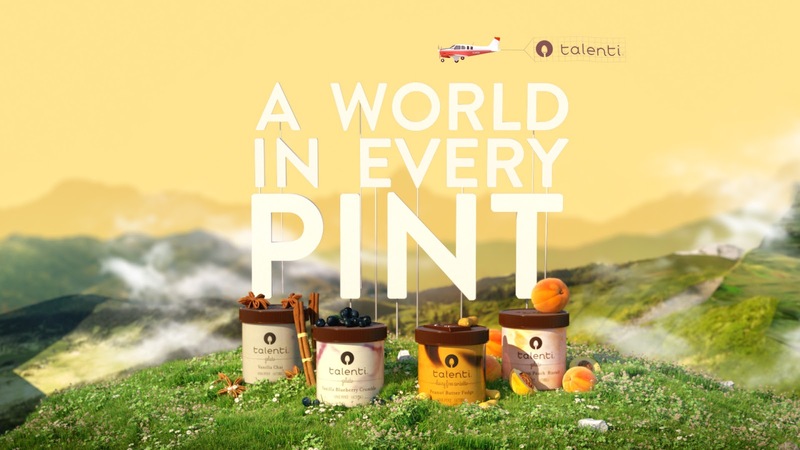 Now part of the Unilever group, Talenti has since grown into the best-selling packaged gelati in the United States. Talenti began as a gelateria in 2003 and has since grown into the best-selling packaged gelato in the United States. A wholly-owned subsidiary of Unilever, Talenti is committed to using artisanal methods and uses only the finest, carefully sourced ingredients — Belgian Chocolate, select coconuts from the Philippines and dulce de leche from a classic Argentinian recipe are just a few of the many fine ingredients used to create Talenti gelatos and sorbettos. Unilever is one of the world's leading suppliers of Food, Home Care, Personal Care and Refreshment products with sales in over 190 countries and reaching 2.5 billion consumers a day. In the United States and Canada, the portfolio includes brand icons such as: Axe, Becel, Ben & Jerry's, Breyers, Caress, Clear Scalp & Hair Therapy, Country Crock, Degree, Dove, Fruttare, Good Humor, Hellmann's, I Can't Believe It's Not Butter!, Klondike, Knorr, Lever 2000, Lipton, Magnum, Nexxus, Noxzema, Pond's, Popsicle, Promise, Q-tips, Simple, St. Ives, Suave, Talenti Gelato & Sorbetto, TIGI, TRESemmé and Vaseline. All of the preceding brand names are trademarks or registered trademarks of the Unilever Group of Companies.